About: Established for more then 50 years, The Grenadier looks like the perfect picture postcard English pub and is discreetly hidden away in an exclusive Belgravia mews. While the food is reliable and based on British cuisine, the Bloody Mary's are practically world famous. You can eat at the bar or in the restaurant, but it is often crowded. Catering for private parties of up to 12 guests is available for upon request and seating on the pavement area is provided, weather permitting. 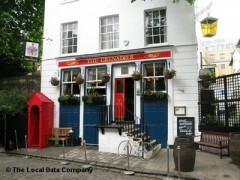 Tucked away in a quiet mews in up market Belgravia, The Grenadier would appear to be the perfect little pub. However, don’t be fooled, the spectral activity that surrounds the pub is off the charts. Haunted in the main by the ghost of a soldier – beaten to death by his comrades having been caught cheating at cards – the Grenadier is both beautiful and deadly. It’s like an angel with poisonous lipstick. Objects disappear, furniture rattles without explanation and icy chills hang in the air. If you can swallow your fear, you’ll love the quaint pub thing it’s got going on though. We came for dinner last night, we had booked a few days earlier, but when we arrived our table wasn't availabe, but the waitress was very kind and kept us informed and when she couldn't give us the table in the restaurant she found another table in the bar. So we were seated within 30mins. Service was quick and quite efficent, but being shouted at by the barman for moving a candle, was not the high point of the evening. But It was to dark to read the menu. We had beef wellingtn which was excellent. Washed down with a well recommended rioja. Really enjoyed the evening, but did get the impression that there was no-one in charge. We tried to get drinks from a clearly harrassed barman, and our food from a obviously overworked waitress, She was helpful, polite and took the time to understand all our needs. I have been serveral times and am looking forward to next visit.